Mock Tudor guest house, offering accommodation on three floors, 200m from Falmouth's most popular beach. 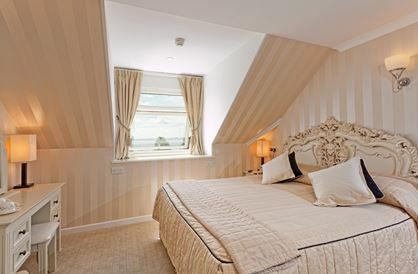 3 ground floor rooms available and balcony rooms with glorious sea views over Falmouth Bay. 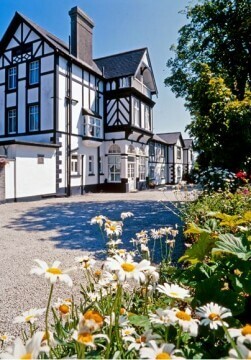 All rooms centrally heated with colour televisions and freeview. Free WI-FI access available. Large carpark with two entrances. Enjoy breakfast in our elegant panelled dining room. Full English Breakfast and various choices for vegatarians. Close to town centre, other beaches, tennis courts, the Princess Pavillion for evening entertainment and a short easy walk to the town centre, the National Maritime Museum, Pendennis Castle (English Heritage), Ships and Castles swimming pool and fitness centre. 200m from the coastal footpath, Golf Course, and Gylly Beach Cafe for evening meals. Reductions for early season holidays. Quality accomodation in a smoke-free atmosphere. AA Graded 4 Stars. No pets. Less than an hour to The Eden Project.